How Much Money Should You Keep in Checking and Savings? Checking and savings accounts are important tools for managing your money. You certainly shouldn’t be storing money under your mattress or in a freezer. But just how much money should you keep in your checking and savings accounts? Checking accounts aren’t known for carrying high-interest rates. Even banks offering high-interest checking accounts often provide tiered-interest rate structures that need to be navigated to realize the full value. So, your goal with a checking account should never be to accrue interest, it’s just a better place to store your money. The amount in your checking account should be sufficient to cover the monthly bills, provide you with some ready cash for other expenses, and act as a buffer to avoid potential overdrafts. The remaining money should be kept safely in savings, because your checking account can quickly become a financial weak spot. Crooks use skimmers on ATMs at gas stations or in stores such as Target to steal information off debit cards and hack your account. The rise of massive data breaches in the last few years should make you wary of using debit cards. But, if you’re committed to always swiping a debit card instead of a credit card, you should keep the minimally acceptable amount for your spending habits in a checking account. A hacker can make withdrawals from your account as soon as they gain access to your information. It’s best to minimize potential damage by keeping the majority of your liquid assets in savings and staying on the defensive by protecting your money. Use your credit card for a majority of purchases. Credit cards have better fraud protection and don’t give a thief direct access to your money. Only use ATMs inside a bank. Cover your hand when punching in a pin associated with your debit card. 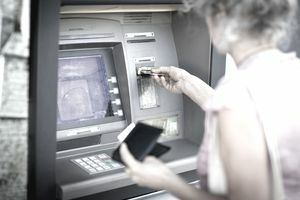 Hackers will often put cameras in compromised ATMs to get your pin information. Set up text alerts for your account balances and transactions. Understand your bank’s liability policy associated with a checking account. Gone are the glory days of high-interest savings accounts. Today, anything north of one percent is a good deal for consumers. Internet-only banks typically offer the highest interest rates of 1 percent or higher, while traditional brick-and-mortar banks stay around 0.01 percent. On $10,000 in savings, it’s the difference between earning $100 and $1. While a $99 difference is significant and savings should be kept in the highest interest rate account possible, you still shouldn’t be sitting on much more than six to nine months’ worth of living expenses in savings. This should include money to cover rent or mortgage payments, utilities, phone bills, transportation costs, and average food costs. It’s a financial imperative to have easy access to an emergency fund that’s kept in a non-risky vehicle. But it’s also important not to get into the habit of hoarding money in a savings account because you’re too afraid to invest it. Ultimately, your money will start to lose value to inflation if it remains strictly in savings. There is an exception: if you’re saving up for a down payment on a home, you may want to keep a bulk of it out of the market to avoid risk. Once you’ve hit your six to nine months emergency savings fund, you can start to dabble with putting your money into investments. You should consult a financial professional and educate yourself to determine the best way to invest your money. You will also need to assess your risk tolerance. Beginners can start investing without stock picking but instead by opening an index fund, mutual fund, or exchange-traded fund (ETF) through low-fee investment companies such as Vanguard, Fidelity, and Betterment. Just be sure any money you invest won’t need to be accessed in the case of a financial emergency and that you have enough liquid money to cover life’s unexpected surprises.